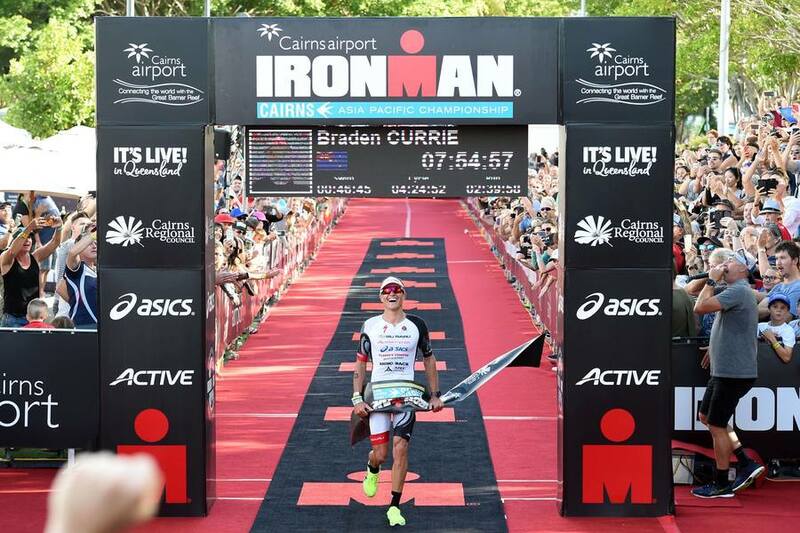 Ironman Cairns 2018 men's winner Braden Currie. Massive crowds, record times and perfectly cool weather: Ironman Cairns 2018 is already being hailed as the best ever. Braden Currie from New Zealand is the 2018 men's champion, while countrywoman Teresa Adam came home first in the women's division. Both are believed to have finished the course in record time, cheered on by excited locals and fans who packed out the finishing area at the Esplanade. Social media was abuzz with today's action, with TTNQ chair Wendy Morris describing it as "brilliant day". "Well done to all - organisers, supporters and competitors - just a great event for the region with some of the pro's saying our Great Barrier Reef drive between Cairns and Port is the best bike leg in the world!" Ironman Cairns 70.3 men's winner Simon Hearn crosses the finish line. Sunshine Coast athlete Simon Hearn and Melbourne’s Laura Armstrong led from the front to score impressive wins in the men's and women's divisions of IRONMAN 70.3 Cairns. Hearn, 24, completed the course in an impressive 4 hours and 9 minutes to win the men's division, while Armstrong was the fastest female athlete with a time of 4 hours, 34 minutes and 53 seconds. Despite a headwind picking up on the final 30kms of the run leg, the lead athletes enjoyed cooler temperatures under cloud cover. Armstrong's win was even more impressive given she had limited preparation in the lead-up to today's race. “I came here with the goal of just racing because I took a month off in March to get married," she said. "When I came back I told my coach Sean (Foster) I was going to do Cairns 70.3, he was a bit surprised because it only gave us eight weeks to get ready.